Why is it Called Yelp? Yelp, a publicly traded company (YELP) was founded by Jeremy Stoppelman and Russel Simmons in 2004. The company is headquartered in San Francisco, California. Yelp aims to help consumers connect with local businesses. The company’s rating system (5 star reviews) and filtering options make it easy for consumers to find the perfect place to eat or visit. Similar to Foursquare, consumers can check-in to receive deals, add photos and see what businesses their friends have recommended. Why is Yelp Called Yelp? Stoppelman initially wanted to call it “Yocal” as in local yocal, however he couldn’t obtain the domain name. David Calbraith, an early employee, suggested the name Yelp. Stoopleman’s first reaction was it sounded like a cry for help. After sleeping on it, he liked that it was short, memorable and how it tied into what Yelp was all about: helping consumers make better choices. Being crunched for time in the decision, Yelp was born. SEE ALSO: Why is it Called foursquare? Where did the “aha moment” come from? Back in 2004, Stoppelman searched Google for a new doctor and realized there was no way to determine if “doctor A” was better than “doctor B.” Traditionally, when you have a problem, you ask a trustworthy friend for advice. Although this process may sound easy, it’s not. People are busy and want to make their own decisions quickly. With the growing usage of the internet, Stoopelmen knew he couldn’t be the only person struggling with this common task. Yelp’s first product didn’t include social networking, it was just an email service where friends could exchange local businesses. Simply put, it’s word of mouth – amplified. We see this time and time again, the idea comes from a problem the founder actually struggled with. It’s not like Stoppelman was the first person to recognize the need, people always have great ideas, however few can execute them (232,988M revenue 2013). 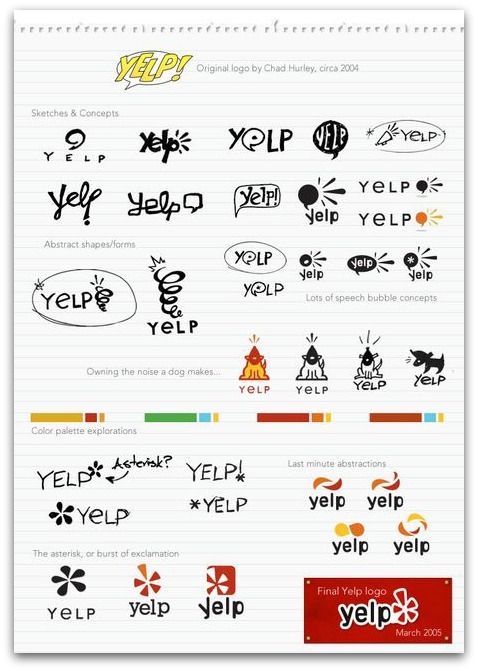 Did you know Chad Hurley, co-founder of Youtube designed Yelp’s very first logo?